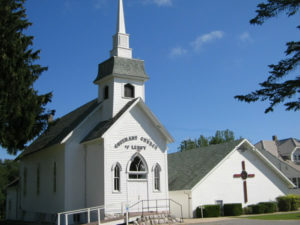 The LeRoy Covenant Church allows rental of both the Sanctuary and Fellowship Hall for events not associated with church events, such as, weddings, funerals, community dinners, etc. However, church events take precedence over outside rental events; therefore, building use forms must be submitted to secure the date(s) requested. Make sure to review the Church Rules Form to make sure your rental event can comply with the rules. Print off the Building Use Form, complete it, and mail it or drop it off to the church office. The mailing address is P.O. Box 181, 201 Cherry Street, LeRoy, MI 49655. You will be informed via phone whether the date(s) is available for the event. If you do not have Acrobat Reader on your computer, download a free version to view and print these files.